“China is not trying to destroy the old boys’ club — they are trying to join it,” said Jim Rickards in May of 2015. It was Jim’s pithy way of saying Chinese leaders don’t want to kick over the table where Western powers make Big Global Decisions. They just want a few more seats at that table, in line with China’s status as the world’s most populous country and (depending on how you measure it) the world’s largest economy. 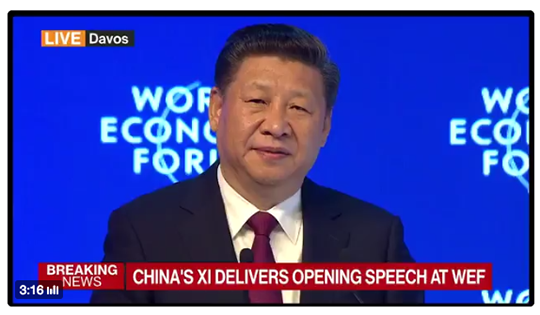 It’s the first time a Chinese president has dropped in on the global elite’s annual shindig in Davos, Switzerland — aka the World Economic Forum. Ah, but what about a currency war? The yuan weakened nearly 7% against the dollar during 2016 — almost double the pace of 2015. “Mr. Xi also reaffirmed China’s long-standing pledge that it won’t purposefully devalue its currency to help exports and engage in a currency war with its trading partners,” The Wall Street Journal tells us. That’s an artful dodge. Without explicitly saying so, Xi is leaving open the possibility of purposefully devaluing the currency for a different reason — to avoid depleting China’s foreign exchange reserves. We return to a chart we shared eight days ago. China’s forex reserves have dropped by 25% from their peak in mid-2014. “This was due to capital flight in various forms, legal and illegal, including debt repayment,” Jim explains. Why the capital flight? “Wealthy Chinese,” Jim goes on, “are trying to get their money out of China as fast as they can because they fear a new maxi-devaluation is coming” — along the lines of 1994, when Beijing devalued the yuan by a third in one fell swoop. The mainstream would have you believe this chart is no big deal; $3 trillion is still a substantial pile of money, right? 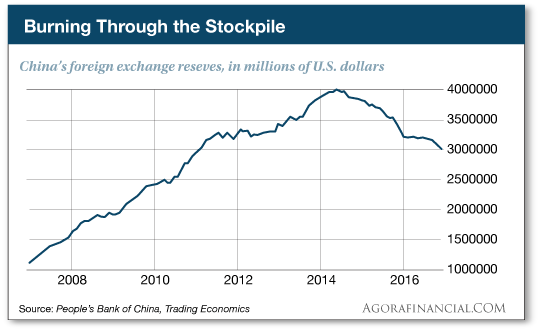 Wrong, says Jim: “About $1 trillion of the remaining reserves are illiquid (for example, hedge fund investments made by China Investment Corp., the sovereign wealth fund).” They’re not the sort of thing that can be sold off in a hurry. OK, but that still leaves $2 trillion, right? Uh, all right, but that still leaves $1 trillion. That should be plenty to avoid going broke, right? What can China do to avoid going broke? “It can raise interest rates to defend the currency, slap on capital controls or devalue the yuan. “Interest rate hikes will kill the economy and accelerate China’s credit crisis. Capital controls will choke off new foreign direct investment and force capital flight into illegal channels without actually stopping it. A maxi-devaluation is the simplest and easiest way out of the box for China. But now along comes Trump to upset Beijing’s calculus. Trump routinely berates Chinese leaders for suppressing the value of the yuan relative to the dollar. Then again, Trump told the London Times that he’s more or less taking the weekend off and Monday will be what he considers “day one” of his administration — heh. Here’s the thing: As long as Trump keeps that threat hanging over Xi and his deputies, they have zero incentive to delay a maxi-devaluation. “The U.S.,” Jim says pointedly, “will have taken away China’s only motivation to play nice.” No reason not to rip the Band-Aid off and get it over with, right? Will they pre-empt Trump and do it on Friday, stealing his inauguration thunder? Or will they wait a couple more weeks or months? They can’t wait too long; remember, Jim says China will be out of liquid forex reserves by year-end. Whenever it happens, “the resulting currency and trade war will make the 11% stock market correction of 2015 look like a picnic,” Jim says. In fact, Jim believes it could add up to the biggest global currency shock since the British pound was devalued 50 years ago. But the scenario also presents a splendid trade opportunity — with 200–400% profit potential whenever the Chinese pull the devaluation trigger. You don’t have to play the risky currency markets to do it, either. Jim will show you how to pull it off during a live online training session tomorrow at 7:00 p.m. EST. You can watch it FREE. But we do ask that you RSVP by submitting your email address; that way, we know how many people to expect and we’ll set aside enough server capacity to accommodate everyone. Here’s where to sign up and guarantee your spot. Trump’s dollar remarks are whipsawing markets after the proverbial long holiday weekend. As we write, all the major U.S. stock indexes are in the red. Small caps are taking it worse than blue chips; the Dow has shed 21 points, to 19,864. Treasuries are rallying, pushing yields down; the 10-year yield rests at a six-week low of 2.34%. Gold has rallied to $1,212, its best showing since mid-November. Chalk that up to dollar weakness; Trump has managed to talk down the dollar index to 100.5, its lowest level since mid-December. Another currency factor at work in the markets today — a rally in the British pound. Prime Minister Theresa May, speaking at Davos, confirmed the United Kingdom will pursue a “hard Brexit” — limiting immigration from the European Union, even if that means British goods will be subject to EU tariffs. In theory, that should be bad for the pound, but May also put an end to months of uncertainty by confirming Parliament will vote on the final arrangement, whatever it turns out to be. There’s one economic number of note this morning, and it’s our first indication of how the economy’s doing so far in January: The Federal Reserve’s Empire State survey reveals New York state manufacturing is expanding, albeit modestly, for a third straight month. “The biggest tech trend of 2017 is the smart, connected, self-driving car,” says Ray Blanco, back home from the Consumer Electronics Show in Las Vegas. Ray believes one of his picks in Technology Profits Confidential is also buyout bait in the autonomous-vehicle space. And another one is carving out a niche in artificial intelligence — so that a car equipped with its electronics can learn to drive itself after a few hours. Subscribers to Technology Profits Confidential will get a full post-CES briefing from Ray during a live conference call this Thursday afternoon. 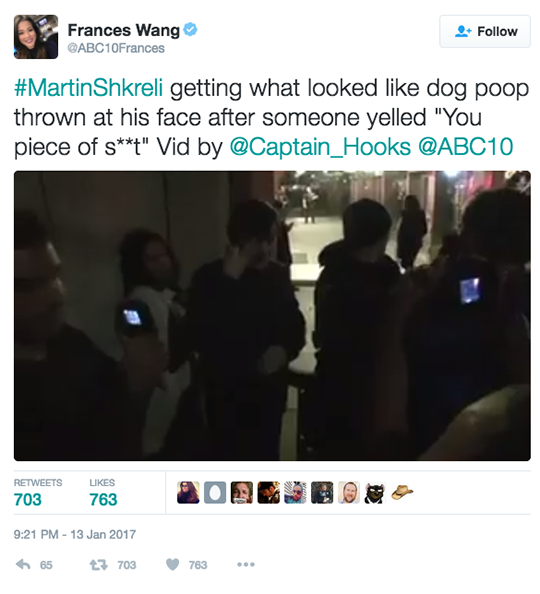 “Pharma bro” Martin Shkreli wants to make it known he was not pelted with dog feces on Friday the 13th. In the 16 months since he achieved infamy for leveraging obscure pharmaceutical regulations to make scads of money — hey, it’s easier than, you know, innovating — Shkreli has proceeded to fully embrace his inner jackass. And so he’s hit the college lecture circuit with Breitbart provocateur Milo Yiannopoulos. “I agree with the reader who suggested you stop bashing Trump,” begins a new week’s mailbag. “It never gets old watching you troublemakers at The 5 get scolded by the crowd of cranks who believe that you are anti-Trump and by their mirror images who believe that you worship at the altar of Trump,” a reader writes. “Being a Trump supporter myself, I felt some sympathy toward the writer of the pro-Trump missive on Friday,” reads our next entry. “However, I just don’t equate your critique of Trump appointees and proposed policies as an outright beat-down on Trump himself. I actually appreciate your analysis of his proposals, even if I often hope these proposals would realistically work out. “It’s really easy to beat the protectionist drum, for instance, and criticize the Chinese government for a host of evils. However, Jim Rickards’ research inside China and his analysis were actually quite helpful. No hype, no propaganda, no China lovefest, just straightforward analysis. “I don’t see any bias toward or against Trump from you guys, just assessments of current affairs and how current events and the media are covering facts, news or rumors etc. Adds another: “I really appreciated the time you took to defend your position to the reader that complained about your so-called ‘bias’ against Trump. I am a new subscriber, and I appreciate the information you give to your readers. I also appreciate the fact that someone should frame the information exactly how you present it — as information for an investor to make their own informed decisions. “If I were going to The 5 for a crusade against Trump, you would’ve fallen REALLY short and I would be severely disappointed! P.S. No matter who’s in charge in the Oval Office, it pays to follow the money. One of our leading analysts says Trump is about to unleash an $11.1 trillion tsunami of wealth. Will you capture your share? All it requires is a $100 grubstake. Here’s where you can get started.